Led by Counselor Rudy French. Explore the uniqueness of Christian Counseling as compared to other counseling disciplines. Explore case studies, engage in discussions, encounter experiential learning and guided imageries that will help you better understand, empathize, and care for those impacted by pain, grief, death, dying, and bereavement from a Christian perspective. 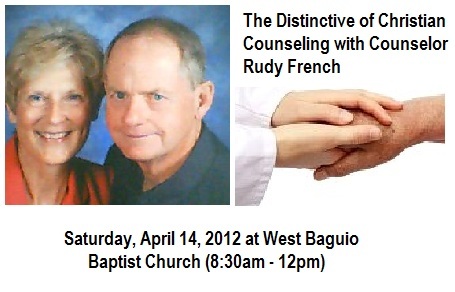 It is 8:30am – 12pm at West Baguio Baptist Church, Baguio City. Cost is P50 for preregistered, P75 for on-site registration. Please call Jehny at 0933-302-0373 or Christian at 0923-737-1054. Reblogged this on West Baguio Baptist Church.